The various districts and neighborhoods of Atlanta offer unique points of interest within our incredible city. Each area has a distinct character, offering different experiences depending on where you choose to visit. Midtown Atlanta vs. Downtown Atlanta is a frequent topic of discussion, and we’re here to help get to the bottom of it. Below we’ve listed some of the main differences between these two popular districts. Take a look and decide for yourself which is your favorite! 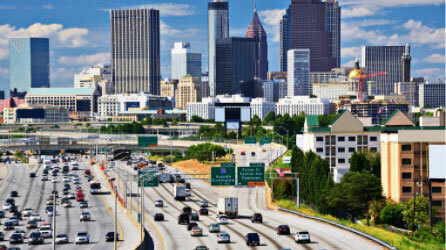 Just make sure you explore our free Atlanta Travel Guide before you go! We included the best attractions throughout Atlanta so you can spend less time planning and more time enjoying your trip! Discover the Best of Atlanta! When you arrive in Midtown Atlanta, you may be surprised by its neighborhood feel. Despite being an urban environment, the acres of green spaces make it a pedestrian-friendly destination with plenty of attractions. Piedmont Park and the Atlanta Botanical Garden are lovely options as well as several art galleries and theaters that earned Midtown its nickname as the “Heart of the Arts.” And, when the sun goes down, the various restaurants, bars, and clubs make Midtown the best area to stay in Atlanta for nightlife. If you plan accordingly, you can even check out some of Midtown’s must-see events like the Dogwood Festival, Music Midtown, and the Atlanta Pride Parade! If you take a short journey south of Midtown, you can find yourself in the Downtown district with plenty of history and impressive architecture. While many people prefer Midtown for the nightlife, arts scene, and cuisine, Downtown Atlanta is home to some spectacular tourist attractions. Here, you can fill your itinerary with visits to the Georgia Aquarium, College Football Hall of Fame, World of Coca-Cola, and more! Local tip: Keep in mind that while you can easily walk to each destination throughout Midtown, you may need to drive or use public transportation to get around Downtown efficiently. Stay at Stonehurst Place and Enjoy the Best of Both Worlds! Come to Stonehurst Place and experience both of these incredible destinations! 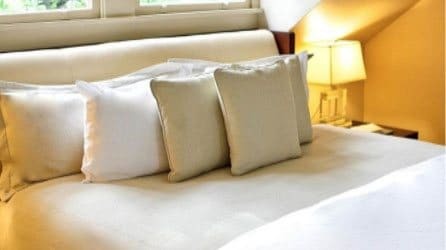 Our elegant, boutique inn is in the heart of Midtown and a 10-minute drive from Downtown! After exploring the attractions in Downtown, you can enjoy the nightlife and performances of Midtown before retiring to our beautifully restored 1896 mansion. When you take a look inside our Master Suite, that might be all the convincing you need. This space is the epitome of luxury and elegance with a walnut and leather California king-size bed, cozy sitting room with a fireplace, and heated marble flooring in the bathroom. You can even enjoy remarkable views of the Midtown skyline through your window! Of course, all of our accommodations come with the finest amenities, including gourmet breakfasts that guests love! Reserve your room or suite today to stay at Stonehurst Place and see what makes Atlanta such a special destination! See you soon!